For more info, view these recommended system requirements for iCloud. Tap your Apple profile at the top of the Settings menu. Automatically uploads and stores entire library in iCloud to access photos/videos from all your devices. Create albums to share with other people. Tap iCloud (upper-left) to return to the previous screen. Tap Keychain then tap the iCloud Keychain switch to to turn on or off. If prompted, enter the iCloud password then tap OK. If prompted, tap the iCloud Keychain option then follow the appropriate screen prompts. Screen prompts could include entering existing security code or creating a new one. Tap Find My iPhone then tap the Find My iPhone switch to turn on or off. If desired, tap the Send Last Location switch to turn on or off then tap iCloud (upper-left). 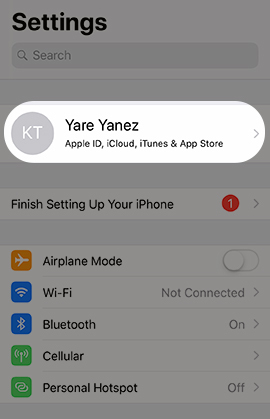 Tap iCloud Backup then tap the iCloud Backup switch to turn on or off. To manage iCloud backup options, click here. Tap iCloud to return to the previous screen. Tap iCloud Drive switch to turn on or off. If prompted, tap Upgrade to iCloud Drive. If not on main iCloud screen, tap iCloud to return. Tap Look Me Up. . . then tap any of the app switches to allow or not allow. Apps that request permissions to allow others to look you up by email appear.